In 2015 Andrew T. J. Kaethler and Sotiris Mitralexis organized a conference in Delphi Greece that engaged with the theological and philosophical questions surrounding the relationship between history and ontology. 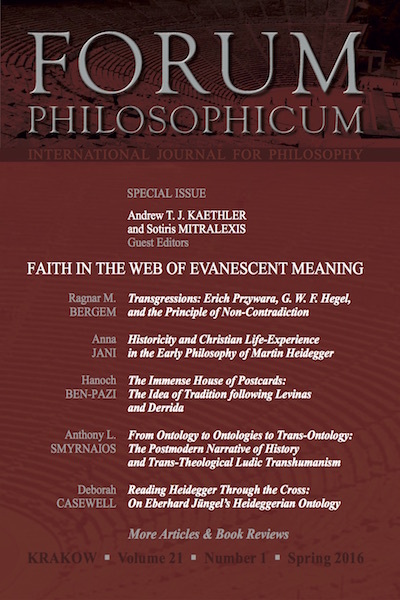 The theme of this volume of Forum Philosophicum––“Faith in the Web of Evanescent Meaning”––grew out of the conference; four of the five papers were presented in Delphi. All of the papers seek to make sense of truth and meaning in relation to the human world of flux and change. Heidegger, Hegel, Derrida, Jüngel, and Przywara are the most recognizable figures explicated herein with perspectives dramatically ranging from a welcoming embrace of Transhumanism to a critical explication of the entelechy of postmodern thought in light of the Cross. Marcin Dolecki: Philosopher’s Crystal: The Treacherous Terrain of Tassatarius.